Draft: 1999, Philadelphia Phillies, 10th rd. Marlon Jerrard Byrd… Married Andrea Kravitz; has one daughter, Gianna (1/11/06) and one son, Marlon Jr. (12/21/07)… 1995 graduate of Sprayberry High School (GA), where he was All-State in football and baseball… Attended Georgia Tech… Suffered an injury to his right leg in which he sustained muscular damage and an infection which cut off the circulation to the nerves; underwent three operations to correct the problem… Transferred to Georgia Perimeter College, where he earned an associate of science degree in business (May 1999) and rededicated himself to baseball… Played Little League, Babe Ruth, Connie Mack and semipro ball… Served as 2003 Chairman of the Phillies Rookie and RBI Leagues program… Hobbies: Kettlebells, muay thai and snorkeling… Signed by: Steve Gillespie. In a career-high 154 apps hit .264 with 28 doubles, a career-best 25hr and 85rbi...led the Phillies in home runs, extra-base hits (55) and total bases (263)...among National League right fielders ranked second in HR and RBI, third in total bases and T3rd in extra-base hits...among all NL batters ranked T8th in overall HR and T3rd in HR vs LHP (9)...hit his 25th HR, a new career high, on his 37th birthday (8/30 at NYM)...on New Year's Eve was traded to the Reds, along with cash, for minor league RHP Ben Lively. Began the year with Chicago (NL) before being traded to Boston on April21...Released by the Red Sox on June 14. 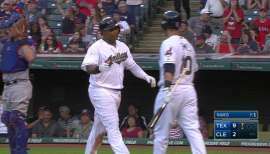 ...Hit a combined .210 (30-143) with a home run and nine RBI. 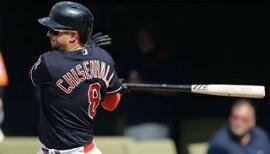 ...Suspended 50 games for a violation of MLB's Joint Drug Program on June25 and was reinstated on August 21...Did not sign with a team for the restof the season. ...Played winter ball for the first time in his career...Hit .318 (70-220) with 16home runs and 46 RBI for the Mexican League champs, Culiacan. Marlon hit .276 (123-for-446) with 22 doubles, two triples, nine homers, 35 RBI and 51 runs scored in 119 games in hissecond season with Chicago...reached the 20-double mark for the fourth-consecutive season and the fifth time in his career...Missed six weeks after he suffered multiple facial fractures below hisleft eye after being hit by an Alfredo Aceves pitch, May 21 in Boston...landed on the D.L. the following day...did not require surgery. Took batting practice for the first time following the incident onJune 13...after a four-game rehab assignment at Triple-A Iowa,was activated, July 2...Enjoyed a career-high 16-game hitting streak, April 28-May 16, hitting.371 (23-for-62) during the run...was the first player in the majors torecord at least two nine-game hitting streaks on the year...Went 100-for-341 (.293) against right-handed pitching compared to a.219 mark (23-for-105) off southpaws...Produced a .291 batting average (68-for-234) on the road, 32 pointshigher than his .259 average (55-for-212) at Wrigley Field...Was a .321 hitter (63-for-196) during the day compared to a .240batter (60-for-250) at night...Hit .314 (72-for-229) with nobody on base, .235 (51-for-217) withrunners on, .198 (26-for-131) with runners in scoring position and.118 (2-for-17) with the bases loaded...Led the club with a .344 May batting average (22-for-64), as well as a.323 mark (30-for-93) in July...Hit .302 (62-for-205) in 53 games before the All-Star break comparedto a .253 mark (61-for-241) in 66 games after the All-Star Game...Drove in a season-high three runs twice: May 4 in Los Angeles andSeptember 21 vs. Milwaukee...Had a season-high four hits, July 24 vs. Houston, going 4-for-5 with adouble, a triple and three runs scored in his 1,000th career game...Twice scored a run in five-straight games: April 2-6 and May 1-6...thattied his career high, done two other times...Collected his 200th career double, May 1 in Arizona...Scored his 500th career run on a solo shot in Pittsburgh, August 2...Recorded his 1,000th career hit and later added the game-winning RBIwith a sac fly in the eighth inning, August 4 in Pittsburgh...Knocked in the game-winning run with a walk-off, bases-loaded infield singlein the 12th inning, September 16 vs. Houston. Marlon was named to his first career All-Star Game, and batted .293 (170-for-580) with 39 doubles, 12 homers and 66 RBIin his first season with Chicago ... collected a career-high 170 hits, surpassing his 155 with Texas in 2009. ... Also set a career mark with 152 games played ... his 84 runs scored weretwo shy of his career-high 86 with Philadelphia in 2003. ... Led the Cubs in games played, at-bats (580), runs scored and hits ...was second in batting average and doubles. ... Batted .357 (61-for-171) against left-handed pitching, tops in the N.L.and third in the majors. ... His .315 road batting average (92-for-292) ranked fourth in the N.L.,while his 52 multi-hit games were tied for fourth-most. ... In the Mid-Summer Classic, drew a walk and scored a run ... recorded anassist from right field, forcing out David Ortiz at second base in the ninthinning.w Was the first right fielder to throw out a runner from first base ona force play at second in an All-Star Game since Al Kaline assistedon a 9-6 putout of Frank Robinson in 1957. ... Batted .317 (105-for-331) prior to the All-Star Break compared to a.261 batting average (65-for-249) after the Mid-Summer Classic. ... Was hit by a pitch a career-high 17 times, sixth-most in the majors andfourth-most in the Senior Circuit.w Was the first Cub to be hit at least 17 times in a season sinceFrank Chance in 1905 (17) ... is just the third Cub in franchisehistory to be plunked at least 17 times in a season ... Bill Dahlenholds the club record with 23 in 1898. ... Hit .330 (30-for-91) with 13 doubles, two homers and 11 RBI whenputting the first pitch in play. ... Boasted eight hitting streaks of five or more games, including aseason-high nine-game run, June 4-12 ... hit .541 (20-for-37) with sevenmulti-hit affairs during the nine-game streak. ... Hit .314 or better in three months: .348 in April, .333 in June and .314in July. ... Belted a three-run homer off Derek Lowe in his first at-bat on OpeningDay, April 5 in Atlanta ... became the first player to homer in his first atbatas a Cub since Henry Rodriguez, March 31, 1998 in Florida off LivanHernandez. ... Again homered, April 8 in Atlanta ... was the first player to homer in twoof his first three games as a Cub since Hector Villanueva, June 1-4,1990. ... Had five-consecutive multi-hit games, April 21-26, tying a career-highalso done August 7-12, 2008, with Texas. ... Collected a season-high four hits July 9 in Los Angeles (N.L.). ... Reached safely in 22-straight games, July 20-August 15, one-game shyof his career-best 23-game run, July 30-August 22, 2009. ... Missed three games after he left September 24's contest vs. St. Louiswith a contusion under his right eye after being hit by his own foul ball. In his final season with Texas, Marlon led the club in doubles (43), games (146), RBI (89), hit by pitches (10) and gamewinningRBI (12) ... his team-leading 10 sacrifice flies also tied for first in the American League.... Ranked second on the club in average (.283), at bats (547), hits (155),extra-base hits (65) and multi-hit games (39) ... also was third in totalbases (262), fifth in runs (66) and sixth in homers (20).... Established career bests for games, at bats, hits, total bases, doubles,homers and RBI.... Tied for seventh in the A.L. with a .333 average (45-for-135) withrunners in scoring position ... had the 13th-best average with basesloaded, a .471 mark (8-for-17).... Hit .300 (115-for-363) against right-handed pitchers.... Recorded his first 20-homer season ... his previous career mark was 10done in 2007 and 2008... Homered twice in a game three times: June 30 vs. Los Angeles(A.L. ), August 20 vs. Minnesota and September 26 vs. TampaBay.... Compiled a .991 fielding percentage (3 E/341 TC), good for 12th amongA.L. outfielders ... made 100 starts in center, 35 in left and six in right.... Tied for second in the league for outfielders with four double plays andsix assists.... Hit safely in each of the season's first six games, going 11-for-28 (.393)during the stretch.... Boasted a .330 clip in his first 23 contests, through May 7.... Hit in a season-high 11-straight games, July 30-August 9 ... hit in 17 of18 games, July 22-August 9.... Matched career-high with five hits April 15 vs. Baltimore.... Was sidelined August 26-28 with a kidney stone.... His miscue June 30 vs. the Angels ended a 72-game errorless streakdating to September 17, 2008.... Was selected as the Rangers September Player of the Month with a .295average, five homers and 23 RBI in 27 games.... Had 23 RBI in a 22-game span, September 4-27.... Set club record with seven hits in a doubleheader September 8 atCleveland.... Was named the A.L. Player of the Week, September 21-27, after batting.320 with three homers and 11 RBI in seven games.... Connected for his sixth-career grand slam September 26 vs. Tampa Bay... the slam was the 59th homer of his career... Became the first player in M.L. history to have at least six careergrand slams and fewer than 60 homers at the time. Had microfracture surgery and torn meniscus repaired in his left knee on Oct. 1 in Cincinnati performed by Reds MedicalDirector Dr. Timothy Kremchek...despite season-long issues with the knee, including an early-season DL stint, batted .298 with 10home runs, 28 doubles, and 53 RBI in 122 games for Texas...provided one of the season's signature moments with his walk-off grandslam on Aug. 4 vs. New York-AL, a game which began a stretch in which Byrd was one of the league's best hitters through the endof the season...established career best with 46 walks, and matched career highs in homers and doubles...posted highest career sluggingmark (.462) and on-base figure (.380)...ranked among team leaders in hit by pitch (T1st, 9), triples (T2nd, 4), games (4th), walks(4th), runs (5th, 70), hits (5th, 120), multi-hit games (5th, 32), and doubles (T5th)...was on the disabled list April 17-May 13 with leftknee inflammation...hit .313 (5-16) with 2 doubles and 3 RBI on 4-game rehab assignment with Oklahoma (AAA) from May 10-13...had 109 starts, 46 in center, 33 in right, and 30 in left...had team's 2nd-most starts in center, T2nd-most starts in right...hit .277(38-137) against lefties, .308 (82-266) vs. right-handers...had nearly identical averages at home (.299) and on road (.297), as his .297figure away from home was 3rd-best among club regulars...batted .241 (28-116) with runners in scoring position, including .417 (10-24) with RISP in final 18 games of the season...was 2-for-16 with the bases loaded, although both hits were grand slams...hit .368(46-125) in the 7th inning and later...had career-high 6 errors in the outfield, a .980 (6 E/294 TC) fielding pct...his 7 outfield assiststied for club lead...beginning July 7, started 70 of team's final 73 games...batted .129 (4-31) with one RBI and one run over first 13games through April 16 prior to DL stint...hit .377 (20-53) in first 19 games after coming off DL, May 14-June 11, to raise season figureto .286...from June 12-July 8, had a .176 (13-74) average to drop from .286 to .234...beginning July 9, hit .339 (83-245) over hisfinal 68 contests to finish at .298...that included a stretch in which he hit .358 (64-179) from Aug. 4 through the end of the season,3rd-highest figure in the A.L...had 4 games with 4-or-more RBI, 2nd-most by a Texas player in 2008 (Hamilton, 5)...3 of his 4 four-RBI efforts came in a span of 13 total contests from July 29-Aug. 10...led off bottom of 10th with a triple on April 13 vs. Toronto, butwas stranded at 3rd as tying run...began season 0-for-17 before a 5th inning double on April 10 vs. Baltimore (G2)...crested exactly.300 for only time all season on Aug. 29...signed a 2009 contract on Jan. 30, 2009, avoiding arbitration. Marlon joined the Rangers in late May and batted .307 with 10 home runs and 70 RBI in 109 games...Ranked amongst the team leaders in infield hits (tied for first, 18) multi-hit games (second, 41), RBI (third, 70) and runs (fourth, 60)...Ranked tied for sixth in the A.L. with team-leading eight triples...the eight three-baggers also tied for sixth most in Rangers history and were the most triples by a Texas batter in a season since Michael Young's nine triples in 2004...Hit .327 (34-for-104) vs. lefties compared to a .300 mark (93-for-310) against right-handers...Hit .398 (39-for-98) in June, ranking among A.L. leaders in average (5th) and hits (T-5th)...Had a season-high 10-game hitting streak, June 1-12...Started the season with Triple-A Oklahoma after clearing waivers, hitting .358 with six homers and 32 RBI in 44 games. Split the season between Washington and Triple-A New Orleans...batted .223 (44-for-197) with eight doubles, five home runs and 18 RBI in 78 games for the Nationals...Made Washington's Opening Day roster...Garnered a .271 average (42-for-155) with 29 RBI in 46 games with New Orleans...joined the club for the remainder of the season July 1. Hit .264 with two home runs and 26 RBIs with the Nationals. ... Acquired from the Phillies on May 14 for center fielder Endy Chavez. ... Hit .282 (24-for-85) after the All-Star Break. Began season as leadoff hitter...Hit 2nd & 3rd career leadoff HR, 5/5 vs STL & 5/9 at ARI...Moved out of leadoff spot in June...Had a season-high 3 hits seven times (last: 8/29 vs MIL)...After hitting .224 in58 games, was optioned to Scranton/Wilkes-Barre (AAA), 6/20...Hit .263 in 37 games at AAA...Recalled on7/31...Slugged 2nd career grand slam (Pedro Liriano) and had career-high 5 RBI, 8/29 vs MIL...Hit .309 (21-68), 28RBI with RISP; .500 (5-10), 1 HR, 14 RBI with bases loaded...Hit .364 (4-11), 2 2B as pinch-hitter...Of his 106 games,85 were starts in CF...Had 4 OF assists, nearly doubling his career total (9). Opening Day center fielder ... Ranked tied for 4th in NL with 27 infield hits and 9th with a .317 avg at night ... Among NL rookies, ranked 2nd in hits (150), runs (86) and multi-hit games (41); 3rd in avg (.303), on-base % (.366), doubles (28), walks (44) and total bases (207); 4th in steals (11); 6th in RBI (45) and 8th in slugging % (.418) ... Placed on 15-day DL, 4/14, with a left knee laceration, suffered in a collision with CIN's Jason LaRue at home plate ... Activated 4/29 ... Got first ML stolen base, 5/6 at ARI ... Was hitting a season-low .173 through 5/24; hit .326 in his remaining 109 games of season ... Broke up Mike Hampton's no-hitter with a single and 1 out in the 8th inning, 6/19 vs ATL ... Moved to leadoff spot, 7/8 at MTL, and went 3-for-5, 1 2B, 1 HR, 3 RBI and career-best 4 runs ... Hit .317 (102-322), with 62 runs, 6 HR, 31 RBI and 25 BB in 74 games from the leadoff spot ... His 31 RBI were 8th-most among NL leadoff hitters, and tied for the most (Craig Biggio) from 7/8 through remainder of season ... Slugged 2-out, 3-run walk-off HR in 11th inning, 7/17 vs MTL ... Had career-best 15-game hit streak, 7/20-8/2(2), .364 (24-66), 18 R, 4 2B, 1 3B, 1 HR, 6 RBI; longest streak on team and 2nd-longest among NL rookies ... Hit 1st career leadoff HR, 8/6 at COL (Chin-hui Tsao) ... Hit game-tying grand slam, 8/27 at MTL (Hector Almonte); 1st career slam and career-high 4 RBI ... Led the NL with 25 runs in September ... Drove in only run in 1-0 win, 9/5 vs NYM .. . Hit GW RBI single in 11th inning, 9/7 vs NYM ... Had arthroscopic surgery to repair posterior labrum tear in left shoulder, 10/8, by Dr. Timothy Kremchek in Cincinnati, OH. Began season at Scranton (AAA) . . . Led International League in runs (103) and extra-base hits (59), finished 2nd in hits (160) and 3rd in doubles (37) . . . Phillies Minor League Player of the Week, 4/22-28 (.429, 12-28, 3 HR, 10 RBI) . . . Had 5 RBI, 4/25 vs Toledo . . . Hit a season-high 3 doubles, 7/3 at Columbus . . . Selected to participate in MLB's annual All-Star Futures Game (went 2-3) . . . Hit 3 HR in final 3 games of the Red Barons' season, including a 2-homer game, 9/1 at Pawtucket . . . Hit .250 (3-12) in 3 playoff games vs Buffalo . . . IL postseason All-Star . . . Recalled by Phillies on 9/7 . 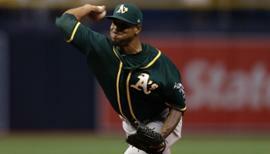 . . Made 1st ML start, 9/8 vs NYM in CF (0-3, BB, R) . . . Singled off Justin Wayne for 1st ML hit, 9/10(2) vs FLA . . . Hit 1st ML home run, 9/12 vs FLA (Michael Tejera) . . . Went 3-for-4 with 2 doubles, 9/14 vs PIT . . . Made 8 ML starts in CF; 1 in RF . . . Hit in 5 of his 10 ML games . . . Rated 3rd-best prospect in Phillies minor league system and 4th-best in IL by Baseball America. Made the transition from low-A South Atlantic League to double-A Eastern League . . . Named EL MVP by both the league and EL Baseball Writers Association . . . EL Rookie of the Year . . . Selected as starter to AA All-Star team (0-2, run) . . . Led EL in stolen baes % (.865) and finished 2nd in runs (1 of only 2 players to score 100 or more), 3rd in SB, tied for 3rd in triples, 4th in hits and average and 5th in HR, RBI and slugging % (.555) . . . Led EL outfielders with .994 fielding %; 3rd in total chances (312) and putouts (304) . . . Led all Phillies minor leaguers in hits, HR, RBI, runs, total bases (283), and slugging % and tied for 1st in games with Lakewood's Juan Richardson . . . First player in Reading history to have 20 HR and 20 SB; fell 2 HR shy of being 2nd 30/30 player in EL history (Jeromy Bernitz, 1991) . . . Made first 17 starts in LF, then moved to CF . . . Stole first 11 bases of season without being caught . . . Phillies Minor League Player of the Week, 4/16-22 (.389, 3 HR) . . . Hit 2 HR, 4/21 vs Bowie and 4/27 at Harrisburg . . . Had 9 RBI in 5 games, 4/25-29 . . . Hit pinch-hit HR, 5/9 vs Harrisburg (1st PH AB of season) . . . Had 7-game RBI streak, 5/9-15 (10 RBI) . . . Homered in 4 straight games, 5/9-12 at Portland . . . Had 4 RBI, 5/12 at Portland and 6/30 vs Binghamton . . . Phillies Minor League Player of the Month for June (.400, 7 2B, 1 3B, 4 HR, 17 RBI, 7 SB in 24 games) . . . Twice named EL Player of the Week, 4/23-29 (.385, 10-26, 4 HR, 9 RBI) and 6/25-7/1 (.500, 15-30, 4 2B, 1 3B, 3 HR, 9 RBI, 2 SB, 8 R) . . . Left game, 6/15 at Bowie, with strained right glute, and missed next 6 starts . . . Had 13-game hitting streak, 6/18-7/4 (.460, 6 HR, 17 RBI) . . . Hit .214 (3-14), 2B, HR, 2 RBI in 4 EL playoff games . . . Named Most Exciting Player and 2nd-best prospect in EL and ranked double-A Player of the Year all by Baseball America . . . Played for the Grand Canyon Rafters in Arizona Fall League . . . Named to Topps AA All-Star team. Played at Piedmont (A) . . . Led South Atlantic League in 3B (13) and extra-base hits (57), T-2nd in RBI (93) . . . 3rd in R (104), H (159) and SLG % (.514), 6th in average (.309) . . . Selected to SAL in-season and postseason All-Star team . . . Paul Owens award winner as Phillies best minor league player . . . Topped all Phillies minor leaguers in AB (515), R, H, 3B, RBI and TB (265) . . . Phillies Minor League Player of the Week, 4/17-23 . . . Phillies Minor League Player of the Month for April (.305, 3 HR, 17 RBI) . . . Had 13-game hit streak, 4/17-29 (21-59, 3 HR, 12 RBI) . . . Collected 4 RBI three times: 4/19 vs Hickory, 5/12 at Hagerstown and 5/27 at Greensboro . . . Reached base safely in 15 straight games, 6/24-7/8 (22-59, 2 HR, 12 RBI) . . . Hit .667 (6-9, 11 RBI) with bases loaded . . . Hit .273 (3-11) with RBI in 3 SAL playoff games . . . Rated Phillies' 10th-best prospect by Baseball America. Made pro debut in Batavia (A) . . . Led team in TB (130), HR, RBI, and SLG percentage (.535) . . . Among New York-Penn League leaders in HR (3rd), RBI (5th), and SLG (4th) . . . Hit safely in first 5 pro games (.412, 7-17) . . . Named Phillies organizational Player of the Month for July (.350, 8 HR, 23 RBI) . . . Batted .459 during a 10-game stretch, 6/28-7/9 . . . Collected 4 hits, 2 HR (4 RBI) 7/27 vs St. Catherines . . . Hit .625 (5-8) in the playoffs . . . Named to NYPL Pinckney Division All-Star team . . . Florida Instructional League. How does Byrd's suspension impact Indians? November 3, 2016 RF Marlon Byrd elected free agency. November 3, 2016 Cleveland Indians activated RF Marlon Byrd from the restricted list. June 1, 2016 Cleveland Indians placed RF Marlon Byrd on the restricted list. April 3, 2016 Cleveland Indians selected the contract of RF Marlon Byrd from Columbus Clippers. March 18, 2016 Cleveland Indians signed free agent LF Marlon Byrd to a minor league contract and invited him to spring training. March 18, 2016 LF Marlon Byrd assigned to Columbus Clippers. 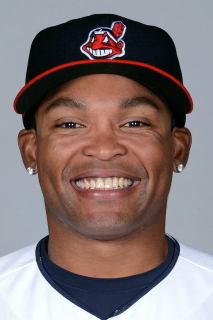 November 4, 2015 LF Marlon Byrd elected free agency. August 21, 2015 San Francisco Giants activated LF Marlon Byrd. August 20, 2015 Cincinnati Reds traded LF Marlon Byrd and cash to San Francisco Giants for RHP Stephen Johnson. June 19, 2015 Cincinnati Reds activated LF Marlon Byrd from the 15-day disabled list. June 17, 2015 Cincinnati Reds sent OF Marlon Byrd on a rehab assignment to Pensacola Blue Wahoos. November 12, 2013 Philadelphia Phillies signed free agent RF Marlon Byrd. August 28, 2013 Pittsburgh Pirates activated RF Marlon Byrd. March 29, 2013 New York Mets selected the contract of Marlon Byrd from Las Vegas 51s. March 28, 2013 Marlon Byrd assigned to Las Vegas 51s. February 1, 2013 New York Mets signed free agent RF Marlon Byrd to a minor league contract and invited him to spring training. January 31, 2013 RF Marlon Byrd assigned to Mexico. October 9, 2012 RF Marlon Byrd assigned to Tomateros de Culiacan. June 12, 2012 Boston Red Sox released CF Marlon Byrd. 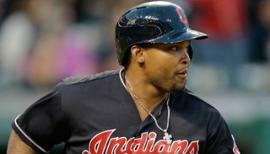 June 9, 2012 Boston Red Sox designated CF Marlon Byrd for assignment. April 21, 2012 Chicago Cubs traded CF Marlon Byrd to Boston Red Sox for RHP Michael Bowden. July 2, 2011 Marlon Byrd roster status changed by Chicago Cubs. June 27, 2011 sent CF Marlon Byrd on a rehab assignment to Iowa Cubs. January 2, 2010 Chicago Cubs signed free agent CF Marlon Byrd. November 5, 2009 CF Marlon Byrd elected free agency.